Beginning in 1845, a potato famine ravaged Ireland’s agricultural landscape and devastated the Irish people. When potato blight started destroying Ireland’s primary subsistence crop in 1845, it quickly spread throughout the island nation and left many Irish peasants starving. During the nineteenth century, Ireland was a predominately rural society in which most citizens rented land and lived off of the crops they grew on the land. For the average Irish family of four, one acre of land provided enough potatoes for the family to eat for a year. The potato was part of the foundation of Irish society in the mid-nineteenth century, and its crop failure caused society to crumble. The potato famine transformed Irish history as it devastated the mainland of Ireland and motivated millions of Irish citizens to emigrate in search of better opportunities. In the six decades prior to the blight in 1845, the potato had supported massive population expansion within Ireland. Within that time, the population doubled from four million to eight million citizens. The potato crop growing season lasting nine or ten months, allowing families to subside on a single crop. The first report of the potato blight was recorded on August 20, 1845, and by October one-third of the potato crop was lost to the blight. Throughout the nineteenth century, Ireland was ruled by the British government, at that time led by Prime Minister Sir Robert Peel. By November, Peel established the Relief Commission and ordered large quantities of Indian corn from the United States to provide relief to the Irish peasants. During 1845, there was still food available despite the potato blight, but most Irish peasants could not afford to purchase the food because they were dependent on subsistence potato farming. Prime Minister Peel managed to ward off starvation during much of 1845-1846, but the situation became desperate during the summer of 1846 after Peel left office. The blight reappeared in July 1846, and destroyed three-fourths of the potato crop. Peel’s successor, Prime Minister Lord John Russell, had a much more relaxed approach towards relief efforts, and largely expected Ireland to find relief without government intervention. Rather than directly provide food to the starving Irish people, Russell provided large scale employment through public works projects. In the public works schemes, starving Irish citizens worked on projects such as road building in exchange for money from the government. However, the projects took a long time to organize, and many Irish citizens died of starvation because they could not afford to purchase the small amounts of corn imported from the U.S. Combined with a severe winter that began in November 1846, disease and death became widespread throughout Ireland. In November, the Quakers formed the Relief Committee of Society of Friends to distribute soup to the hungry. By December 1846, 441,000 men, women, and children worked under the public works projects to try to get enough food to survive. The winter of 1846-1847 was particularly harsh, and increasing numbers of Irish citizens became dependent on public works. By March 1847, the number of workers in the program peaked at 714,000 Irish citizens. The workers in the program performed hard physical labor every day, and still barely made enough money to eat due to inflated food costs. Starvation and disease remained widespread, even as the government spent increasing amounts of money on the public works schemes. Due to the success of the Irish Quaker’s soup kitchens, the government began reconsidering their relief efforts. Starting in the spring of 1847, the government opened soup kitchens throughout Ireland, where the destitute got free soup and those earning some wages got subsidized soup. By August, about three million people utilized the soup kitchens on a daily basis. In terms of the potato blight, the 1847 crop was largely unaffected, so the government suspended the soup operation in September. Unfortunately, while the crop was mostly free from blight, not many Irish citizens had planted crops since the blight started in 1845, so the yield in 1847 was not enough to feed the populous. The blight was controlled, but the famine continued due to lack of available food. As the soup kitchens closed, the government focused relief efforts on the workhouse system, which was the welfare service previously established under the 1838 Poor Law Act. Under the workhouse system, the poor were given housing and food in the workhouse in exchange for labor, but the conditions were often overcrowded and unsanitary. In order to control the demand for spots in the workhouse, outdoor relief was also established in 1847, providing assistance to the elderly, the sick, and widows outside the confines of the workhouse. For many Irish citizens, the prospects of escape from the famine were appealing, and an estimated 220,000 Irish people emigrated during 1847. Limited stabilization occurred from 1848-1851, as some peasants began replanting crops and the established relief programs continued operation. However, evictions became increasingly common as peasants continually failed to pay rent to landlords and sources of food were still limited. By July of 1848, it was clear that the potato crop failed again, as only one-third of the pre-Famine levels were produced. 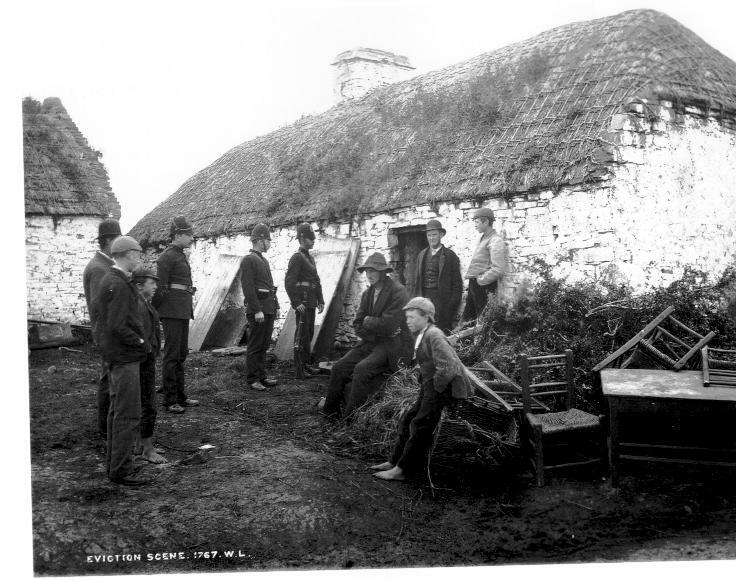 Evictions in rural areas increased in 1848, and an estimated 180,000 Irish emigrated. In 1849, relief programs such as outdoor relief and the workhouses reached peak levels due to a continuing lack of available food. As of June 1849, about 800,000 Irish citizens received outdoor relief, and by the end of 1849, over 250,000 citizens occupied the workhouses. The potato blight was largely eradicated by 1850, but the Irish still did not have sufficient food available, and effects of the famine continued. In 1850 and 1851, over 30,000 additional families were evicted from their homes, which caused a further strain on the relief system. By the end of 1851, Ireland still struggled to reduce relief efforts and stabilize rural society, but the potato blight was largely over. Watch episode 4 of “When Ireland Starved” to learn more about emigration and the lasting effects of the famine on the Irish population. An estimated one million Irish died during the famine, from a combination of starvation and disease. Escalating the population decline, 1.2 million Irish emigrated from 1845-1851 in order to escape the famine. Additionally, just less than one million Irish emigrated in the following four years, bringing the total to over two million emigrated over the decade 1845-1855. The Irish Diaspora abroad in countries such as Great Britain and the United States helped spread news of the famine and motivated many countries to send monetary aid to Ireland. The millions of Irish emigrants also drastically altered the societal landscape of primary destinations abroad. In the United States, Irish-American communities developed in numerous cities across the country, and Irish culture influenced American society. Within Ireland, repercussions of the famine such as evictions and emigration continued through the 1850s, but the country began to stabilize. With over three million Irish dead or emigrated by 1855, Ireland began the process of restructuring society with a vastly smaller population. Potato blight did not completely disappear, but the Irish learned to be less dependent on the potato for survival. Anger towards the British government for an inadequate response to the famine helped fuel nationalist sentiment throughout much of Ireland, which contributed greatly to the successful Irish quest for independence at the beginning of the twentieth century. For an overview of the famine and emigration, watch the documentary Famine to Freedom.